While out exploring uncharted territory within Jelly World, a rather adventurous Jelly Blumaroo finds himself in the jelly badlands. Full of jelly volcanos erupting with jelly lava, this is no place for a Neopet... and to make matters worse, a decidedly non-jelly beast has spotted him. If he doesn't want to become lunch, he had better bounce, and fast! I don't suppose we can talk this out..? In Bouncy Supreme, you use your mouse to control the trajectory of the Blumaroo's jumps, guiding him from pillar to pillar over the lava. When the game begins, there will be sixty seconds on the clock, representing how long you have until the pterodactyl catches him; for every successful jump, you will gain three seconds. If you manage to collect all of the coins between two pillars, you will receive a time bonus of an additional two seconds. The game will continue until you run out of time or lose all of your lives, either of which will result in a Game Over. The green pterodactyl radar in the upper-right lets you know when your time's almost up! The mouse cursor is shown as a white circle, connected to the Blumaroo by a line. Moving your cursor up or down will change the angle of the jump, while moving it toward and away from the Blumaroo will affect the jump's power. Once you've lined up the power and angle, click the left mouse button to jump. For information on the power and angle you should use for various situations, see the Strategy section below. There are two ways to earn points in Bouncy Supreme: collecting coins, and reaching the next pillar. Each coin is worth 2 points regardless of color, and appear in rows of four or five coins. The number of points you receive from landing on a pillar depends on the distance the Blumaroo jumps, with longer jumps worth more points. In the image below, the shorter jump would be worth 22 points, while the longer one would be worth 38. 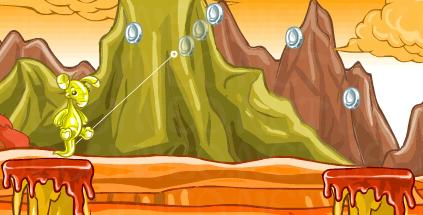 At the start of the game, you will have a line of dots showing the trajectory of your jump. After the first three jumps, however, this guide will disappear and you will be left to your own judgment. The recommended angle and power to use for each jump will vary depending on the Blumaroo's position on top of the current pillar, so the table below is only a rough guide. It shows an approximate range of angles and power, based on how high the next pillar is relative to the one the Blumaroo is standing on. A simpler (though occasionally inaccurate) way to gauge where to aim your jump is by using the positions of the coins. By pointing the white aiming line at the second coin (in a series of four) or the third coin (in a series of five), you will usually find the appropriate angle to reach the next platform. The amount of power required can be judged by how great of a height difference there is between the pillars; if the pillars are even, put around two coins' width of distance between the coin and the line. If the difference is one of the extremes seen above, as much as four coins of distance could be required. Press the R key at any time during gameplay to toggle the pterodactyl radar on or off. Type bouncebouncebounce to receive an extra life. This can be used once per game. Aim at the highest coin in a sequence to easily figure out the angle for your jump. Collect all coins in a sequence to add extra time to your clock.